When Melissa woke up, the first thing she did was find her suitcase and started packing for her vacation spot. "Melissa, you almost ready?!" Her mother yelled. "Almost!" She yelled back throwing her stuff down at the bottom step. "Oh hey Melissa!" Her brother greeted her coming out of his room. "Hey bro, I'm just getting ready to move out." Melissa reminded him as she dragged her stuff out to her car. "Need someone to drive ya?" Her brother asked. "No thanks! Look, I'm 16, I can drive my own self!" Melissa reminded him again getting into the driver seat. When her brother leaves, she is off! They wave at each other, and she heads to the nearest Motel 6. When she gets there, the first thing she does is turns off her car and checks her phone messages. "Hope I have somethin' good." She reminds herself as she grabs her stuff and heads in the building to the check in desk. "Hi, can I help you with something?" The manager asks. "Yeah, do you have any rooms avaliable?" Melissa asks with a smile. "Um...yeah, we have 35 and 110 open." The manager reminds her as she pays to get in one of them. "What's this for?" He asks. "Um...Room 110!" Melissa reminds him as he takes the money and gives her the room card. She walks up the stairs to the room, and when she gets there, she slides the card through the slot and walks in the door. "Why are you spying on her Louis?" Harry asks with confusion as Louis keeps on staring out their window. "I don't know, she's just looking hot." Louis replies stepping away from the window. "Alright, who's looking at me?" Melissa asks from outside, then she sees Louis in the window. "Louis Tomlinson?" Melissa says in confusion as she looks through their window. He steps outside to join her, and says "Hi Melissa! Did you just move in to Motel 6?" Louis greets her with confusion. "Let go of her, she's mine!" Troy reminds Louis as he takes Melissa by the arm. "Louis, I have to go." Melissa reminds him as she takes a walk down the balcony of the motel. "What the hell do you think you're doin' with him?" Troy asks sqeezing her arm. "Oww, that hurts Troy!" Melissa cries as she runs over to Louis and stays safe. "What's wrong Melissa?" Louis asks with confusion. "Troy, he's trying to hurt me to death." Melissa reminds him as she hides in their room with the rest of the boys. When she gets in there, she just falls to the ground. "Where's Melissa? I need her!" Troy asks with confusion. "She went in my room, and she don't love you anymore." 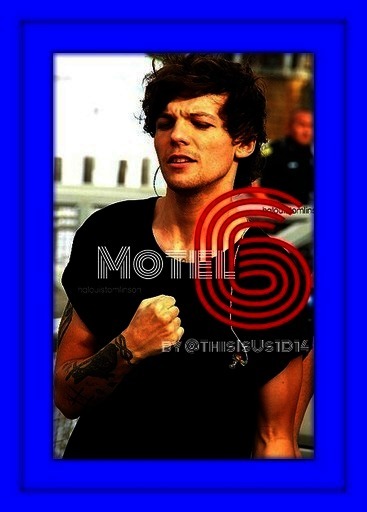 Louis reminded him as Troy barged into One Direction's hotel room. "Melissa?" Troy asked leaning down in front of her starting CPR. Just then, Louis came in bonking Troy on the head. "Melissa, you're awake!" Louis says in surprise. "What the hell was that for?" Troy asks taking the stick and hitting Louis back. "I told ya, she don't love you anymore Troy!" Louis reminds him as he gets on the ledge. "You won't have my girlfriend, you will DIE!!!" Troy demands as he stabs Louis. "Nooooo!!!" Melissa yells so the others can hear. "What? What happened?" Niall asked seeing Troy's knife. "What the hell did you do to Louis?" Niall asked pointing at him. "Its too late he's already dead." Troy reminds them as Melissa looks down to see Louis' body being moved to the ER. When Louis gets in the paramedics truck, Melissa starts crying and goes back into her room to go have some alone time. "Hi Melissa, you want me to get you anything?" Niall asks walking into her room. "No, I just need some alone time right now." Melissa replies crying as Niall sits by her. "I know we're all worried about Louis, but I'm pretty sure he'll be fine." Niall reminds her as he wraps one arm around her shoulder. "Okay, I guess he'll be okay." Melissa replies trying to wipe her tears away from her face and lies flat on her bed.